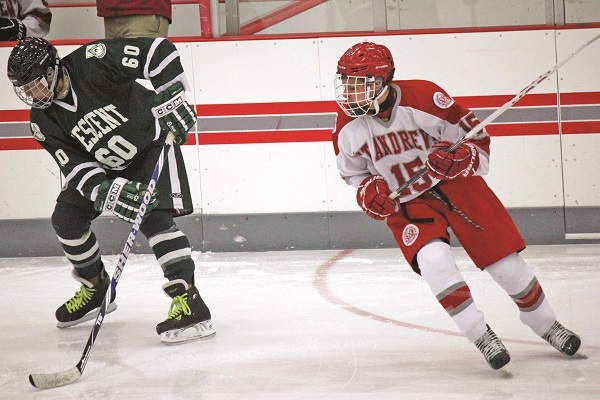 The Junior Varsity St. Andrew’s College hockey squad took to the ice Monday afternoon looking to bounce back from a tough 7 – 0 home loss to Nichols School last week. La Brier Family Arena played host to Toronto’s Crescent School, fresh off their own second win of the season. Crescent had the home team on their heels right from the get-go, maintaining possession in the offensive end while the only reprieve the Saints could manage was in the form of icing the puck. However, solid goaltending from Aidan Link kept the game competitive, highlighted by a quick blocker save on a point-blank shot early on. He continued his stellar play into the first Saint’s penalty-kill of the game, but was eventually beaten when a loose puck would squirt out to a Crescent forward, roofing it over Link for a 1 – 0 lead. The Saints managed less than a handful of shots in the first period. Link continued his stellar play into the second, opening up the frame with a fantastic glove save hoping to spark his team as they headed into their first powerplay of the game. Unfortunately, it was more of the same, as perhaps the best chance of the powerplay was a Crescent 3-on-1 that had Link flailing to keep his team in the game. And the Saints very much were until only ten minutes left in the game, when Link was finally beaten a second time on a scramble in front of the Saints’ net. With time running out and less than three minutes on the clock, the Saints got a great opportunity on a 2-on-1, but the Crescent goaltender made an impressive pad save on the deke to backhand. Crescent added a late empty-netter to seal the game by a 3 – 0 score. After travelling to Upper Canada College to take on the Varsity Blues on Wednesday, the J.V. Saints are in action again Monday at home, hosting De La Salle at La Brier Family Arena. St. Andrew’s will host the 32nd annual MacPherson Hockey Tournament from January 30 – February 1, both at the La Brier and at the Aurora Community Centre. For full schedules, visit www.sachockey.ca. Come out and watch the boys today at 4:00 at the LaBrier Arena. Also a follow @liam.joiner wouldn’t be a bad idea and @matt_leroy because he’s actually kind of good.